Originally a small barn built in the 1930s this cottage has been gradually extended to provide a dining room,kitchen and small conservatory and provides accommodation for upto 4 persons in two bedrooms. Located in the pretty coastal market town of Lymington bordering the New Forest National Park on one side and the shores of the Solent on the other, the cottage is some 400 metres from the sea, marinas and coastal walks around the sea wall which stretches as far as Keyhaven and yet is only ten minutes walk away from the High Street, it's shops, restaurants ,pubs and busy Saturday Market. There is plenty to do and watch without getting into a car, particularly of interest to dog owners and cyclists who can just walk or ride out onto the sea wall and through fields and marshland. A short car ride ,however, will take you out into the Forest with it's walks , horse riding facilities and the beaches at Highcliffe and Milton on Sea. For Youngsters in the summer there's also the revamped sea water baths with swimming, inflateable fun, kayaking, paddle boarding etc just at the end of the road. Access to the cottage is gained via a short gravel drive (so it's quiet) off Stanley Road to a parking area in front of the cottage. Entrance via the conservatory leads into the living room with a sofa and two armchairs , open fire place, television, DVD player and WIFI access. On then to the dining room with seating for six and the kitchen and outside to a sunny (hopefully) paved garden with chairs,table , sun shade and Barbeque. A short hallway leads to a cloakroom then upstairs to a landing with mirrored wardrobe, Bedroom 1 with double bed , chest of drawers and bedside chests , bedroom 2 with two single beds, chest of drawers and bedside chests. Finally a bathroom with bath , WC and basin an electric shower and further shower off the mains at the tap end. The parking area can accommodate one or two cars , there is further parking on the road immediately outside the drive on Stanley Road. The cottage is situated close to the owners house and oak framed garages which can provide shelter for bicycles. The kitchen is fully equipped including washing machine, fridge/freezer, dishwasher etc as you would expect. Hairdryer in bathroom. Guests are requested to provide their own towels otherwise heating,electricity ,linen, WIFI are all included. Logs and kindling are provided for one or two burns but otherwise supplies can be obtained from local garages. Changeover dates Friday 4pm until following Friday 10am. Please note pets are accepted on the strict understanding that they are kept under control, are well behaved, clean, up to date with flea and tick prevention so and are not permitted in any of the bedrooms or on the furniture. Please clear up after your dog if necessary. Please advise if pets will be staying and number of pets. Hi I'm David I worked in Shipping in London where I lived with my wife and two children In 1983 we bought a cob cottage in Brockenhurst and loved the area so much that we moved full time down here in 1990. My wife died two years later and with the kids into University in 1999 I moved to Lymington into 'Pippins' 25 Stanley Road and in 2003 bought 'Salterns Cottage' which is down a gravel drive alongside 'Pippins'. In 2011 I started work on a new eco house at the back of 'Pippins' formerly occupied by several decrepit garages and I now live in the new House (25A or The Outback as we call it) I retired from Shipping in 1998 and 'Pippins' is rented out on a long term basis but Salterns Cottage makes an ideal holiday cottage. Apart from looking after the properties, I have a boat in lymington and I tend t0 spend a month or so away on the boat in the summer. The cottage is a 'Tardis' and has a considerable amount of room and goes back a long way. There's an enclosed ,quiet ,sunlit garden at the rear (animals are enclosed) The cottage is simple but comfortable and has everything required . Other points of interest/benefits are outlined in the property description. New combi boiler fitted 2016 provides heating to radiators in all rooms. Open Fireplace with fire guard. A basketful of logs and kindling is provided but guests may have to top up supplies which are obtainable from local garages. There is parking on the gravel turning area in front of the cottage (which is located down a gravel drive off Stanley Road. Depending how many cars arrive there is further parking on the road outside. New oak framed garages were erected last year, there is one open bay in which Bikes can be stored however the garages themselves are for the owners use. Internet works well off owners internet next door. Kitchen towels are provided but guests are required to bring their own bath towels and beach towels.If you arive without towels we can supply them. Coffee pot for making ground coffee drinks. Reasonable sized dining room with Pine table and chairs and plates etc stowed in two pine dressers. The secluded back garden is paved and contains outside table and chairs and sunshade. local 9 hole golf course at Walampton just across the river about 1 mile away. Brockenhurst Manor Golf course about 15 minutes by car. Very quiet and peaceful setting. Very good location. Cottage very comfortable. Garden sun trap. Only complaint is defective fridge. We had a fantastic holiday in Salterns Cottage and would highly recommend it as a great base. Lovely secluded cosy cottage. It suited us, we were able to bbq most nights and the enclosed space was brilliant for our dog. Very quiet at night - we slept really well! It’s in a great location, loads to do in the area. We hope to return very soon. Hi , many thanks your kind remarks, much appreciated, so glad you enjoyed your stay and of corse the weather was brilliant. Hope to see you again. We had a wonderful week in a roomy and well equiped cottage in a nice location. The owner was very welcoming and obliging. Wonderful weather helped as well. Lovely Cottage and very close to centre of town. stay. Unfortunately the only thing he couldn't sort out was the weather, but we don't hold it against him. 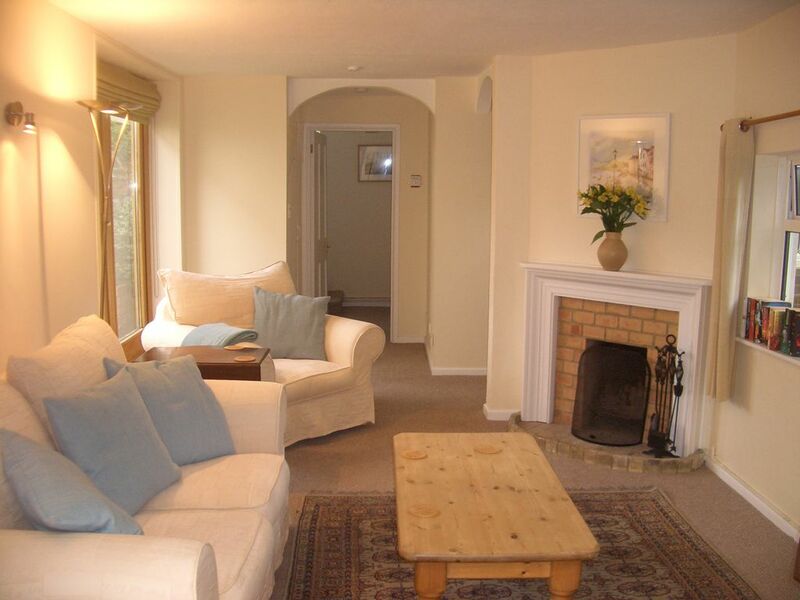 The Cottage had all of the facilities of a home from home, warm, comfortable and clean. The cottage was a good size with everything we needed. The owner was next door but we didn't get in each others way but he was there if we needed anything. Lots of walking and a chance to see a cousin not seen for 50 years. Would recommend.